You might be surprised to find that more single women than single men own homes. Last year they accounted for 20 percent of all homeowners, while single men accounted for only 12%. This substantial demographic change has caused builders to pay closer attention to the type of homes they build. 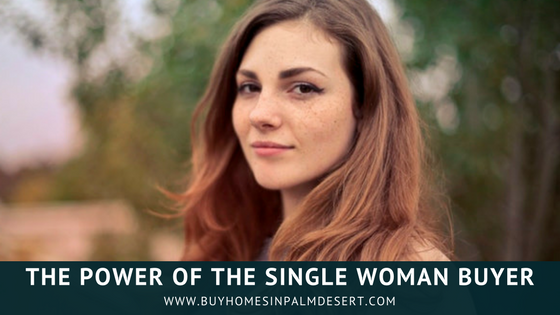 Palm Desert area is well suited to the Single Woman Homeowner. The U. S. Census describes a single woman homeowner as a female household head that owns her home. The single woman, with or without children, may cautiously approach homeownership. Each of the categories of divorced, separated, widowed or never-married single women are facing a huge learning curve in this endeavor. Would it not make sense to use the services of an experienced professional Realtor to be your guide? First-time home buyers – Many single women, when transitioning from a rental, a divorced situation, graduation from school, or the death of a male counterpart often find themselves befuddled and in the position of not even knowing what questions to ask. A systematic, experienced approach by yours truly will be most welcome. Reasonably priced homes – The Palm Desert has reasonable pricing and spaciousness in its homes. If children are a factor, you will be pleased with these characteristics. Condos and Townhomes – Single women tend to look toward condominium and townhouse living as a great alternative to the Single Family Home. Safety is associated with numbers and closer living. Additionally, there is often less yard work and home repairs in this type of housing. In town and even out in the suburbs have a wide variety of great Condo or Townhome community living. Related Post: Does a Handshake Deal Make it Legal? There is no question that our changing world has placed a Female Face on Real Estate (http://singlemindedwomen.com/money-tips/the-female-face-of-real-estate/). There are plenty of reasons for you to choose this great place to live. Register on this website and I will help you with your dream of being a Homeowner.